By Jeff Bryant | Originally Published at Education Opportunity Network. 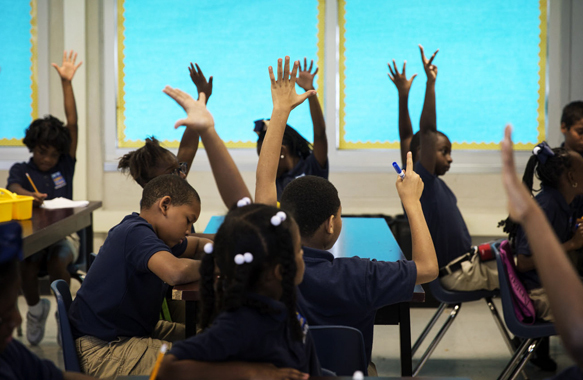 June 25, 2015 at 1:30 PM | Photographic Credit; NPR New Orleans is home to the nation’s first all-charter district. As the tenth anniversary of Hurricane Katrina approaches, you can count on seeing a lot of glowing stories about the great education progress made in New Orleans since a natural disaster killed nearly 2,000 people, emptied a beloved city, and gave public school reformers what they always wanted: a “clean slate” to have their way unencumbered by the messiness of school boards, local politics, and the voices of teachers and parents. This essentially made charter schools the only early option, which Sen. Mary Landrieu could help make possible with federal funds. The U.S. Department of Education had money to start charter schools, but nothing to reopen traditional schools. So, the School Board opened the first charter schools, and by the beginning of 2006, “the structure that still holds today was set,” with an elite group of selected admission schools, privately operated independent charter schools, and the vast remainder of schools operated by the state-run Recovery School District, which would convert those schools to charter management. What’s wrong with this of course is that the people of New Orleans – especially those most chronically disempowered and underserved – had little voice in the remaking of their schools and are still virtually without democratic representation in their schools today. When you get past the headlines though, you find you’re lost in a maze of evidence that could lead to multiple conclusions. For instance, in the article praising what’s happened in New Orleans, you learn that some of that “progress” in NOLA RSD is associated with student demographics in the city have changed, significant amounts of critical data have been left out, and huge gaps in achievement between low-income kids and their more well-to-do peers remain. Even a statistic as seemingly simple as high school graduation rates becomes a slippery eel in the hands of NOLA-style reform propagandist, as researcher Adam Johnson found when he looked into the matter. On his blog, he painstakingly recounts his personal quest to find the source of an often-cited “fact” that NOLA RSD graduation rates improved 50 percent, from 54.4 percent to 77.8 percent, from 2004-2013. His search led him to the discovery that “graduation rates date back to 2005 only.” The 54 percent is a complete fabrication that got passed around, like in a game of telephone, from a dubious source through a series of politicians and media folks wanting to tell their version of the New Orleans story. Other cautious observers of the NOLA model highlight the pitfalls of a top down takeover model that too often leaves the interest of poor and working class families behind. Perry also sees the “many nefarious ways” that advocates for the NOLA model present their case for closing gaps and showing gains, and he questions whether those statistical measures are over-emphasized compared to other important values – including community empowerment, democratic engagement, inclusion, and racial diversity. So what are the lessons to be learned from New Orleans style education reform?